LOS ANGELES – Los Angeles County joined the ranks of municipalities wrangling with how to regulate electric scooters, voting Tuesday to create a pilot regulatory program. Supervisor Kathryn Barger recommended the pilot. The plan — which would apply to unincorporated areas of the county, including Littlerock, Quartz Hill and Lake Los Angeles — is expected to include a consumer-oriented website with safety information. 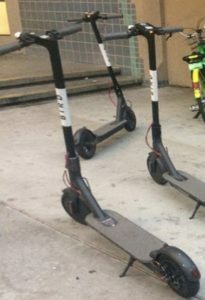 2 comments for "L.A. County set to regulate scooters in unincorporated communities"
Why don’t legislators step it up with issues that truly matter in LA County?